"Withdraw into yourself and look. And if you do not find yourself real beautiful yet, act as does the creator of a statue that is to be made beautiful: he cuts away here, he smoothes there, he makes this line lighter, this other purer, until a lovely face has grown his work. So do you also: cut away all that is excessive, straighten all that is crooked, bring light to all that is overcast, labor to make all one glow or beauty and never cease chiseling your statue, until there shall shine out on you from it the godlike splendor of virtue, until you see the perfect goodness surely established in the stainless shrine"
Centuries ago Plotinus gave a real beauty advise for humanity. I can feel the beautiful fragrance of the phrase. The more I dwell on it, I feel the blessings of Plotinus filling my heart with tranquility. I am of the opinion that reactions and actions at the times of real deep adversities bring out the real beauty within. Socrates was in his living room with his disciples having hearty discussions. All of a sudden they were astounded by a thundering voice of Xanthippe, wife of Socrates. She came out thundering with a pot of boiling water and flung all the water at the face of Socrates. His face was half burned. Socrates said smiling to his disciples "You see friends, thunder is followed by rain". Lord Buddha was walking with his disciple Ananda, suddenly an angry pervert came up to them and with an angry smirk spat on the face of lord Buddha. Ananda was boiling with anger to retaliate, but Lord Buddha in his serene calm asked him, "do you have anything more to say". Ananda asked lord Buddha why he let him go with such a heinous act. Lord Buddha replied: Ananda, this man was so angry that he didn't have words to say. He chose this manner to say. I am serene at heart enjoying myself, if I too get angered and retaliate that means I am not my master and this man is leading my actions. My sincere advice to you Ananda is that you also forget about it and enjoy the inner peace and tranquility. This man went home and was haunted by the serene, calm face of Lord Buddha. He realized the grave folly he had committed and couldn't forgive himself. First thing in the morning he went to Lord Buddha's Ashrama and fell at his feet. He was crying profusely. Tears washed the feet of Lord Buddha. Buddha said to Ananda, this is the same man. He doesn't have words to speak now even. It is his way of saying. Our mind constantly learns and performs in a pre-programmed manner. Day after day, same routine goes on. We care for physical grace, but completely neglect inner wash. 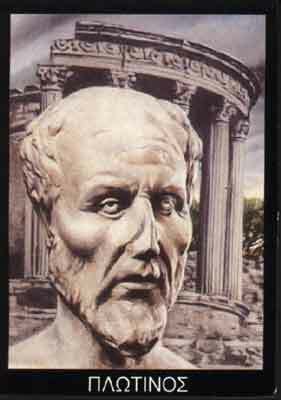 I sincerely salute Plotinus for his marvelous guidance. I remember an incident where Sufi Saint Sri Junnaid Ji had heard of death of his young son. His remarks were thus:" lord loves him so much that he has called him up to serve him". Another incidence is related to Lord Mahavira. He used to remain silent (maun vrata) in the jungle. One farmer told to look after his cow and went away. Since he was in his silence, he didn't reply. When farmer came back he couldn't find his cow, he asked him, but Lord Mahavira couldn't reply due to his silence. Thinking that this man has stolen his cow, farmer started to punish him by hammering nails in Lord Mahavira's both ears. The pain was extremely immense but Lord Mahavira prayed to God to forgive the farmer. As the legend goes, the God said he wanted to punish the farmer but Lord Mahavira earnestly asked forgiveness for him. He said that this experience has shown him that pain is suffered by body but inner calm remains solitary and unaffected. To conclude I wish to say only this much: in this modern era one should not neglect inner beauty. We all face adverse situations, but one should not loose his head and rise to a newer level of inner beauty. This post has been written for real beauty contest.